I put this off for too long, a Coen brothers movie is always approached with a little trepidation. 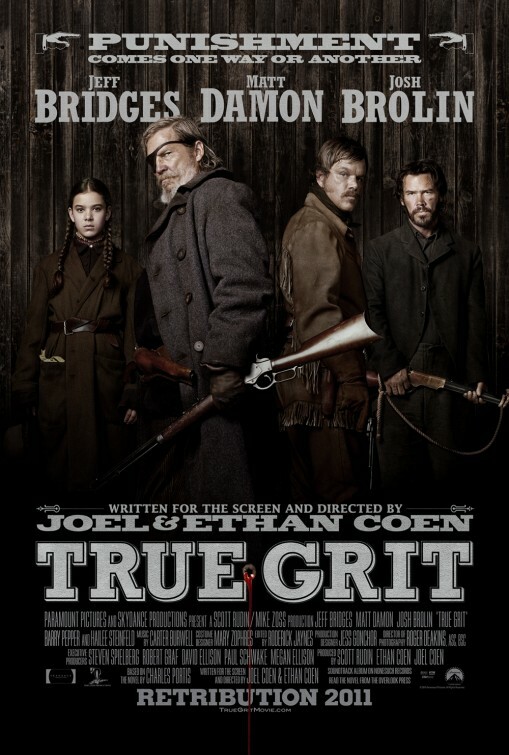 But I shouldn’t have worried, True Grit was outstanding. I found the use of old hymns as the score an interesting way off accenting what was happening. This usage was at its strongest when Cogburn was rushing a snake bit Mattie to help with the last of his strength as “Leaning of the Everlasting Arms” was playing. All the acting was top notch, but Hailee Steinfeld, stole so many scenes with her rapid fire dialog and the surety that she delivered it. With the Coen brothers I never am sure how I am going to receive their movies; there was so much hype and love for it, that I figured I was going to be disappointed like so many of their previous works. But their story telling and vision of the original work had me from the beginning. Too many times of late I drift off during a movie and check Twitter. Or find the trivia at IMDb more interesting. Storytelling is what seems to be lacking in too many of today’s films, but the Coens have revived my hope that the storyteller is not dead.